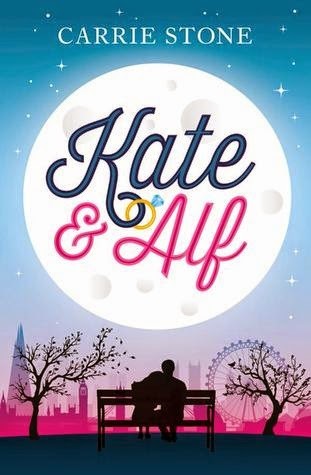 I kindly received Kate & Alf in exchange of an honest review by the author. The first time Kate met Alf and she locked eyes with him, she'd a six-sense feeling he going to be in her life forever. Seven years and a miscarriage later, things start to break. Kate is desperatly waiting for Alf to propose to her. On her thirty-second birthday, she thinks he'll pop the question but all she gets is a puppy. Their relationship is dulled and in need of a repair. It leaves Kate wondering once again where their relationship is heading. What if Alf didn't want the same things as her in the future? Alf is absolutely cluless and thinks everything is fine. When Alf gets a job offer away in Scotland he thinks Kate will just leave everything behind to go with him. He hopes for a fresh start and a better future. It turns out Kate does not think so. Will they overcome their obstacles or are they over for good? When the cover for Kate & Alf had been revealed I was enchanted. You all know I am sucker for a beautiful cover. This is outstanding and beautiful. I think it's the best one Haper Impulse has ever designed. Amazing job guys! Therefor I was so happy when Carrie sent me a review copy of her novel. The saying "don't juge a book by it's cover" fits in this case. Unfortunately there is not always a amazing story behind a outstanding cover. I'd like to start with the things I liked about this book exept the cover. I very enjoyed and liked Carrie Stones writing style. I think it's very beautiful. Not only beautiful also detailed which made it easy for me to settle into the story very quickly. When Kate and Alf temporary go their seperate ways we follow the story out of their point of view. The reader does not only follow the couples point of view also of Megan, Kates best friend and a few others. For many people it might be confusing but I thought it enriched the story and made it lively. Kate works as a nurse in a retirement home. Kate cares a lot about the residents. She is good friends with Lillian and Vivian. They were my favourite background characters. They brought some good fun into the story. A character I did not warm up at all was Alf. There was no connection and I think he was too much focused on himself. I was not happy with some happenings in the story and where the story was leading but the more I read the more it made sense and I was happy for Kate in the end. Apart of all these, Kate and Alf is a very ordinary Chick-Lit novel. Sadly it's nothing I'd remember in the long run. This book needs a breath of fresh air, some real excitement with a bunch of fireworks. We follow the characters in everyday life situation which is nothing too exciting. There were things I liked and things I didn't liked. The characters had potential, interesting backgrounds, secrets they hide. Kate & Alf is certainly not a bad book. Based on the writing, it's obvious the author has a lot of potential and suitable writing background. I'm willing to give Carrie's upcoming releases another chance. Shame the book didn't live up to expectations. It is a cute cover!